The Technique Hair Dryer features a pure ceramic grill, far infrared heat, negative ion conditioning technology, two temperature settings, two speed settings, a detachable concentrator, and a cool shot button. Its compact design makes it perfect for everyday use. The Technique Hair Dryer comes with a custom concentrator and is safe for all hair types. Hair Type(s): Safe for all hair types. Far infrared heat - moves directly into the hair follicle and out to the cuticle to protect strands over time. Negative ion conditioning technology - maintains moisture and eliminates frizz by sealing the hair’s cuticle while boosting shine. Ceramic grill - conducts far infrared heat and negative ions for fast and healthier blowouts. Cool shot button - works to set and smooth blowouts by sealing the cuticle which retains the shape and direction of the hairstyle. 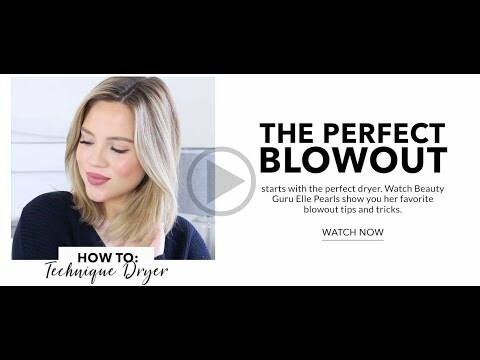 Blowout: Adjust temperature and speed settings for your hair type and dry hair in sections. Set your hairstyle with the cool shot button. What type of motor is the Technique Dryer made with? TheTechnique Dryer is made with an DC motor, great for everyday home use. What is Negative Ion Conditioning Technology? Our dryers emit negative ions which break up water molecules into smaller particles to dry hair faster. This results in a shorter drying time and less damage to hair. What are the settings on this dryer? Does this dryer have a cool shot button? When is the best time to use the cool shot button? It is recommended that you use the cool shot button for 30 seconds at the end of your session to seal the cuticles. What accessories come with this dryer? What is the weight of the dryer? This is our most lightweight dryer at .95 lb. How do I clean the filter? The filter can be unscrewed to allow for regular cleaning. Turn the filter cap clockwise to open then carefully wipe off any debris caught in the chamber. Regular cleaning is necessary to ensure the tool functions properly each time. Can I use this dryer internationally? Unfortunately, this dryer is a single voltage dryer so it only has one voltage option: 110V. It is NOT recommended to be used in other countries with the use of an adapter or a converter. This dryer can only be used under the specified voltage conditions. What is the difference between the Bold and Technique Dryers? Both dryers have the same features. The only difference is the Technique Dryer is a limited edition of the Bold Dryer. Once the Technique Dryer sells out, it can no longer be restocked. Proper care of tools will allow them to last for many years. If your tool does not function properly past the 90-Day Guarantee, you may replace your item under the one-year limited manufacturer's warranty. Only tools purchased directly from NuMeUSA.com or an authorized NuMe seller with a valid proof of purchase are eligible for a replacement under this policy. Please note that all warranty replacements are brand new. We do not repair or refurbish any tools. Damage, abnormal storage or working conditions, accident or negligence by you or by any third party. Failing to operate or use the products in accordance with the user instructions. Any alteration or repair by you or by a third party. Theft or loss of product. To begin the process, please email info@numeusa.com your full order details along with a short description of the problem to receive an RMA number.